Did you know Security Onion? It is a Linux distro specialized on network security monitoring and intrusion prevention, simplify the whole network management with a Ubuntu-based distro that you can start using with just few steps. 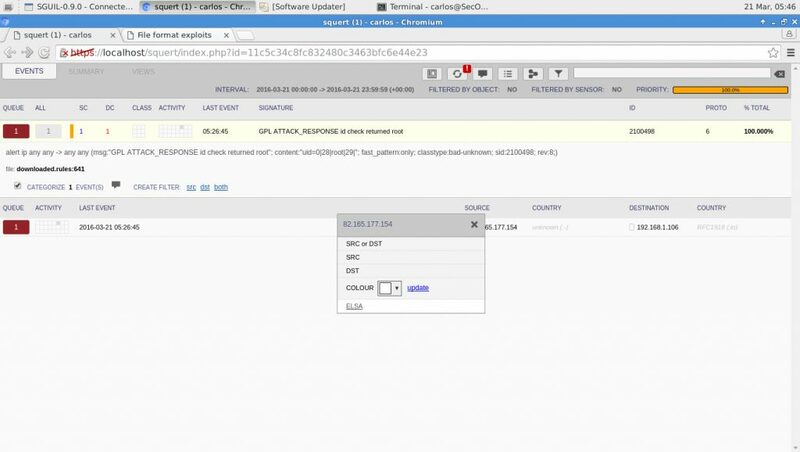 It comes with many valuable security software to monitor your network in realtime or perform analysis on pcap files and/or system logs. Today I will drive you through the installation proccess on a step-by-step basis. At the end of this article you have it installed on your machine and will be able to start to monitor your network traffic and host activity using its tools. Download the Security Onion ISO from Github. 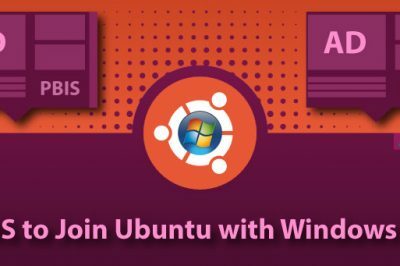 In fact Security Onion can even be installed on distros based on Ubuntu, however this will not be covered here, here is how to install Security Onion on Ubuntu. 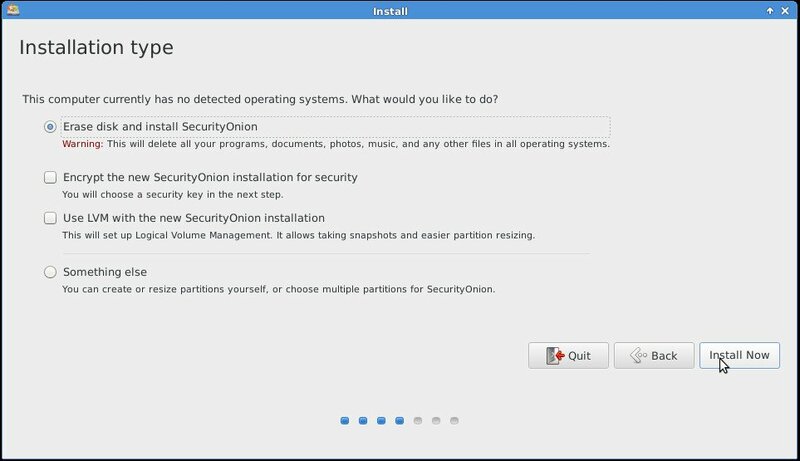 As you start the system with the Security Onion media you will be presented with the following screen, just hit the install option. Once you select the install option the system will start to boot and then show the setup screen. First thing to set is the Operating System language. Now decide either to use or not 3rd party technology, such as Flash player or MP3 codecs. Select how the system will be installed on your hard disk, the disk encryption and LVM setups dig not worked out of the box, so if you are no familiarized with it just click install and then continue when asked. Now select the location, this will set the locale date/time options, click on your country then continue. Select your keyboard layout, use the detection tool if in doubt. Note: Do not select the encrypt me home folder option, despite I did not tried it myself but people complain about that on forums. At the end of this process restart the system to boot from hard disk. Once system restarts you can run the setup script from the desktop, then give the password you set on the last step when asked. Then it asks if you want to set up your network interfaces, choose Yes to setup network. Choose network configuration method to use, we are going to use static configuration. Set the IP Address of this machine. 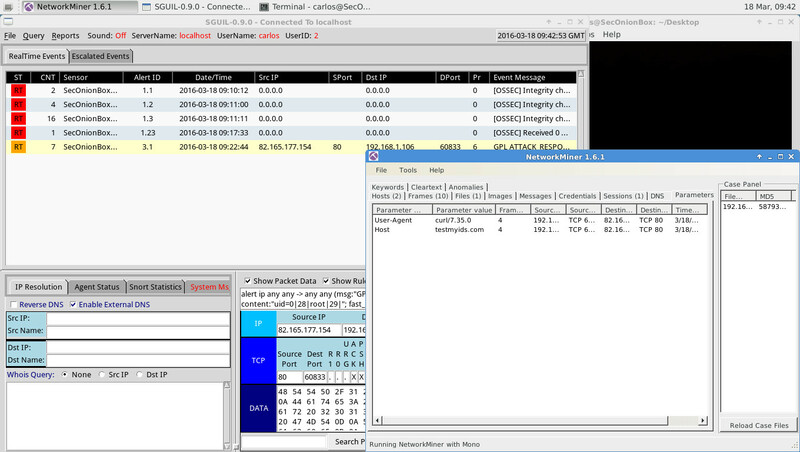 Set IP of the gateway. Set the DNS servers IP . Set any special network settings if needed, then reboot the system again. 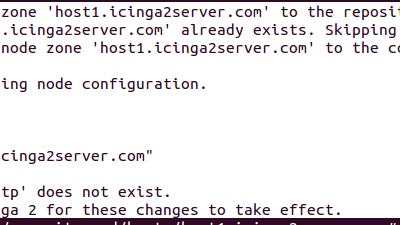 Run the setup script from the desktop again when system restarts and follow the next steps. 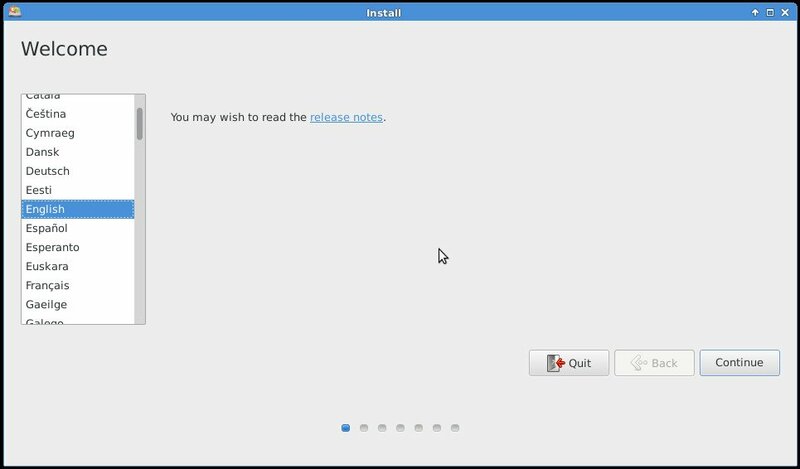 First you choose which mode of the install script to run, We are going to run the Production mode here to show you details. sensor - Install agents for monitoring. server - Install service to manage the monitoring. standalone - Install both, sensors and server, we are going to use this one. 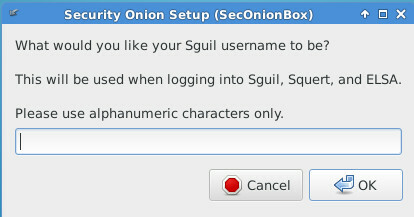 Set a username for Sguil, ELSA and Squert interfaces. Define a password and confirm. Set how many days to keep the log. Set the numbers of days to repair MySQL tables. 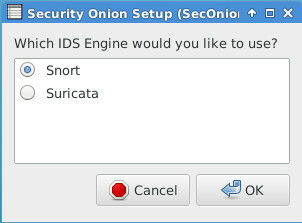 Select IDS engine to use, either Snort or Suricata. Select the IDS ruleset to use. Set the minimum number of PF_RING slots. Enable the use of IDS engine. Enable Bro network analysis framework. Enable the executable file extraction feature of Bro. This feature helps a lot to identify malware. 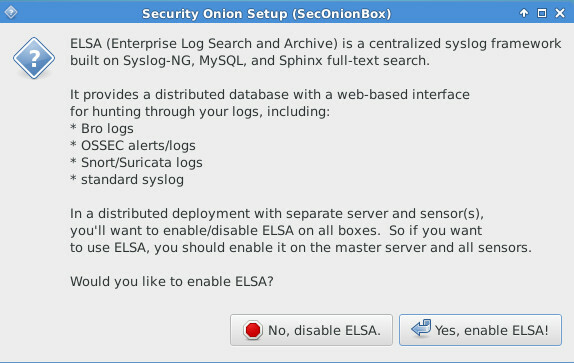 Disable bro http_agent to save resources if your are goingto use ELSA. Enable full packet capture, this is strongly recommended unless denied by disk limitations. Specify the maximum pcap file size in megabytes. This will dpend on your needs and disk availability but something between 150 and 1500 should do the trick for most setups. Enable mmap I/O for pcap files on netsniff-ng for best performance if you have a reasonable amount of memory. Set the minimum space available on the disk to start purging pcap files. 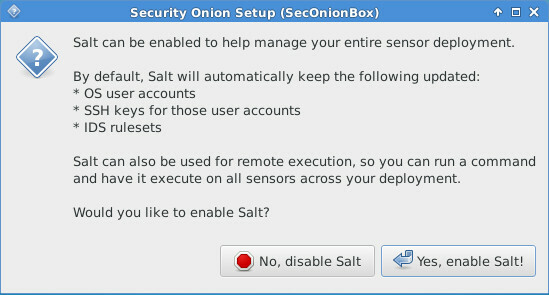 Disable Salt configuration management system unless you are going to run more nodes. 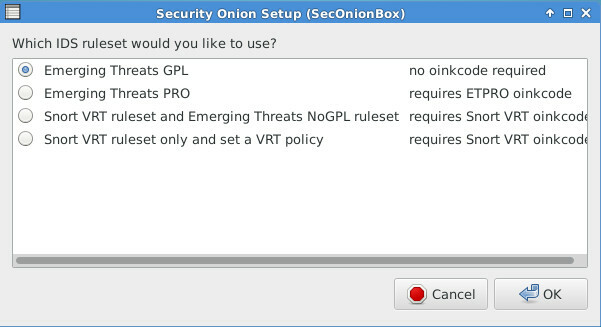 You are done, Security Onion must be working at this point. 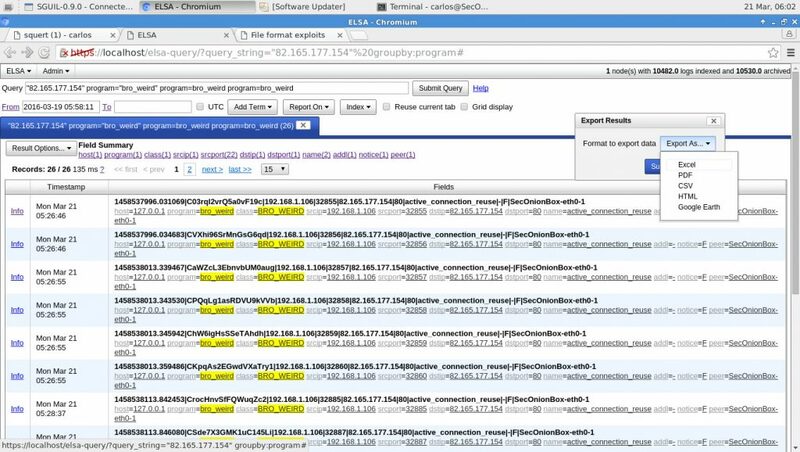 You can start using the tools to inspect your environment now. Here are some screenshots. Squert view on the same event. ELSA search relative to the event. The event above can be analyzed in many other ways on different Security Onion tools, we can go from a simple alert to the very instructions within some malware, it will depend on the incident. This is not the case here, maybe on posts to come we dig deeper on malware forensics or other uses for the security onion tools. Carlos is a technology professional and enthusiast. In his spare time he likes skateboarding and play guitar. Great details, nicely explained. Would be definitely trying.